The only German chassis manufacturer Mach1 kart started at the season kick-off to the ADAC Kart Masters last weekend. The racing series of the second biggest automobile club in the world took place in Hahn and lured 167 drivers to the challenging Hunsrückring. The team surrounding Martin Hetschel started with three drivers and impressed everyone at the OK juniors. Traditionally, the first appointment on the ADAC Kart Masters calendar is the event on the 1.377m long track in Hahn. Being the first of five events during the course of the season of Germany’s biggest kart racing series, the event had a lot to offer last weekend. Great kart racing weather with summer-like temperatures and a cloudless sky made for optimal conditions for a thrilling racing weekend in the Hunsrück. Cameron Boedler started at the OK juniors for Mach1 Motorsport. The German-Brazilian drove on this track for the first time and had a couple of difficulties getting used to the new circumstances in the beginning. During qualifying, the Mach1 driver ended up on the 20th place for the following heats among the field consisting of 30 drivers. There, the youngster showed his potential by coming in 13th during the first heat. Unfortunately he lost a couple of positions during the second and was only ranked 22nd. He then started into the first final race from 19th position. There, the young driver showed a great performance. Due to impressive maneuvers he passed by his opponents lap after lap and fought his way forward to tenth place until the finish line. That wasn’t the end of it yet though: During the second ranked race he was able to tie in with his performance and achieved another top ten result by coming in seventh. 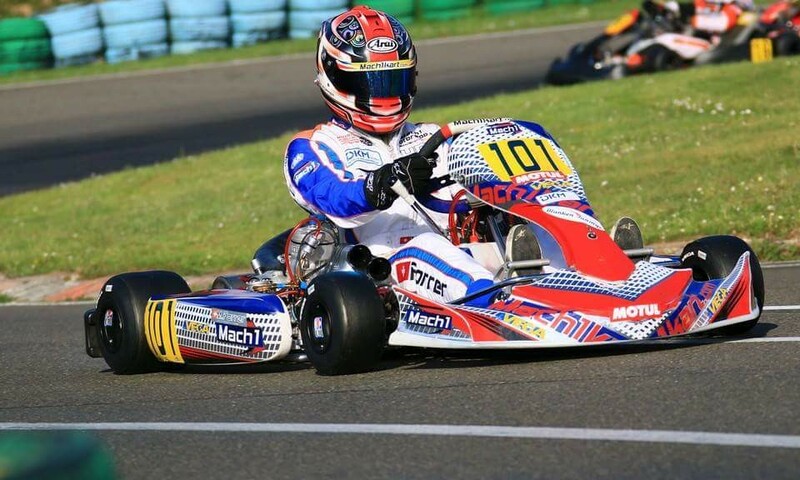 Next to Cameron, Luka Wlömer started at the ADAC Kart Masters with a Mach1 kart for the first time. After a kart racing abstinence of nine months the Berlin resident used the past weekend as an opportunity to test the German quality material. On 21st place after the heats, the 14-year-old drove forward to the 16th place during the first race. During the second, the young driver was involved in a collision at the start though and had to park his kart in the off prematurely. Julian Müller entered the strongly fought for shifterkart category as a soloist. All in all, 36 KZ2 drivers fought for the first championship points and gave drivers and teams hard tasks to solve. After a longer break, Julian Müller showed a successful comeback. On 12th place after qualifying, the young racer optimistically looked forward to the following heats. Julian had lots of bad luck there though. Two fallings out made him fall back to the end of the interim rankings and therefore hindered qualification for the final races. Mach1 Motorsport travelled to Spanish Zuera directly from Hahn. There, the team and Douglas Lundberg are going to start at the second race of the CIK-FIA KZ1 European Kart Championship next weekend. 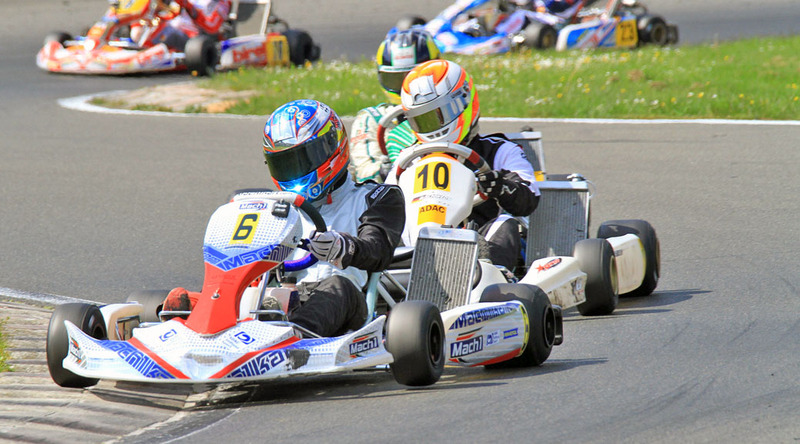 The ADAC Kart Masters started into its new season on the Hunsrückring/Hahn. Eight Mach1 kart drivers started there as well. The 2015 models of the German chassis manufacturer were able to impress from the bambini class to the shifterkarts and celebrated grand successes. In great weather, the 195 participants of Germany’s strongest kart racing series started on the 1.377m long Hunsrückring. In addition to the Mach1 Motorsport team, the Mach1 factory supported teams DS Kartsport and BB Motorsport started with their drivers as well. 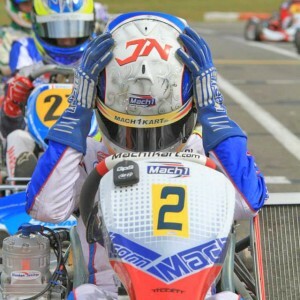 Marco Forrer and Toni Greif started for Mach1 Motorsport at the strongly contested shifterkart class. Counting 51 drivers, the field was completely filled up. Marco Forrer showed a solid performance and was able to improve his performance compared to the DSKM in Wackersdorf. After 22nd place at qualifying, he continuously got better and finished both heats on 11th place. From 14th starting position he drove forward during the first final race to 9th place. His great upwards trend was then unfortunately stopped during the second final race – Marco had to forfeit the race after a collision during the first lap. “The new Mach1 FIA5 Kart feels really good and is even easier to drive than the previous model. This is especially recognizable during the races. It’s a pity that I had to quit the second final race due to the accident. During the first race I drove the same times as the driver on third place”, the Swiss summed up in the evening. His team mate Toni Greif was the best Mach1 driver after qualifying, on 18th place. He wasn’t content with this though – “The tire air pressure and the transmission weren’t right”, Toni commented on his result. He then got on well during the heats and finished these on 12th and 5th places. Unfortunately the disillusionment came after the second heat: Due to his overtaking someone during a yellow phase he was excluded from the ranking and missed entering the final races. “This is obviously very disappointing because the speed was right. During the first two laps things were really confusing due to all the accidents though and I must have missed the yellow flag”, he explained disappointedly. 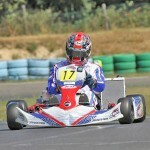 DS-Kartsport protégé Alexander Heil started at the shifterkarts as well. The 2013 X30 senior champion is new to the gear class and achieved a good start by coming in 23rd during qualifying. He was able to improve his performance during the heats then and finished the first one on 10th place. A collision threw him back during the second but he was still able to enter the final races by coming in 24th. He was able to drive forward to 20th place during these and finished the second final race among the top ten, on the great ninth place. In addition to Alexander Heil, Mark Wolf (X30 senior), Miroslaw Kravchenko and Luca Voncken (both bambini) started for DS-Kartsport as well. X30 senior Marc Wolf couldn’t achieve an optimal start in Hahn. He ended up on 18th place at the first final race and was then pushed off the track by an opponent during the second race and had to forfeit. Both bambini drivers showed strong performances though. Reigning vice champion Miroslaw Kravchenko belongs to the title favorites and showed a solid performance during the heats already. He entered the final races on fourth place and finished them on 3rd and 5th places. In the championship he is now on third place after the kick-off weekend. 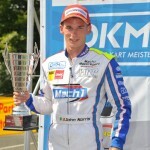 His team mate celebrated his ADAC Kart Masters premiere in Hahn and established himself in midfield immediately. With two top ten results he directly ended up among the cup ranks and is currently on ninth place on the overall list of rankings. Baldur Bahn started into the 2015 season with a considerable training backlog. He felt comfortable in the new Mach1 FIA5 kart immediately though. Unfortunately a couple of quarrels and problems with the carburetor and engine cost him a countable result. The newly appointed team leader and driver in personal union doesn’t have time to bury his head in the sand though: He is going to start at the SAKC kick-off in Ampfing this weekend already. Last but not least, Justin Tabakovic started at the shifterkarts. He continuously got better during his premiere race at the ADAC Kart Masters, but a 21st place and a falling out during the heats weren’t enough to enter the final races. “I really want to praise all Mach1 drivers; they really did a great job this weekend. Additionally I have gotten lots of positive feedback regarding our new FIA5 chassis. I think we really did well with this”, Mach1 owner Martin Hetschel said in the evening, not without pride. To enable an even bigger audience to try the new material, Mach1 is planning some more test days in July, in cooperation with Mach1 factory supported team DS-Kartsport. We are going to publish details promptly. Last weekend, the ADAC Kart Masters’ kick-off took place on the Hunsrückring/Hahn. Mach1 Motorsport sent five drivers into the race and showed strong performances. Unfortunately lots of bad racing luck cost them a countable result. 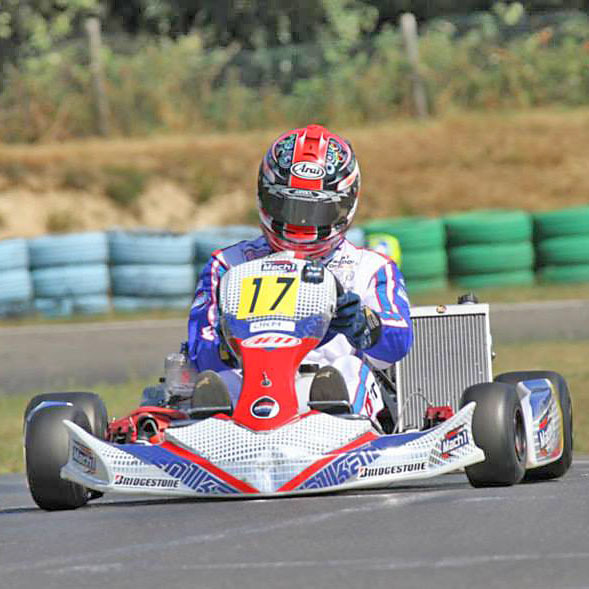 German chassis manufacturer Mach1 Kart travelled to the first of five events of the ADAC Kart Masters with high hopes – drivers of the factory team started in four different classes. At the KF junior class, Sophia Floersch celebrated her debut with Mach1 Motorsport. The fast ADAC Sports Foundation’s supported driver had to get used to the new chassis in the beginning. During the course of the trainings and heats, she became faster all the time and was aiming for the top ten on 14th place on Saturday evening. Unfortunately, her plan was stopped due to a falling out during the first final race. From the back of the field she was able to fight her way forward again during the second race though and ended up on the great 11th place. “We’ve shown our possibilities during the final races. Sophia got used to the new chassis quickly and was really fast. We will continue to work hard until Ampfing and then even more should be possible”, team leader Martin Hetschel said fiercely. Philipp Heim showed a consistently strong performance at the X30 juniors. 37 youngsters started, of which only the best 34 would enter the finals in the end. Qualifying for the final races was no problem for Philipp. He was on 22nd starting position for the first final race and finished the races on 18th and 19th places. 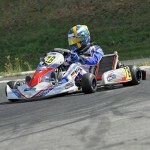 Marco Forrer broke new ground: the Swiss started at the shifterkarts for the first time and faced a difficult task. Counting 50 drivers, the field was strongly manned. After a great qualifying and two thrilling heats, he achieved entering the finals and was able to improve his performance considerably. Coming in 20th and 16th, he was able to keep up with the front midfield and once again proved the high competitiveness of the Mach1 shifterkart chassis. Julian Müller belonged to the favorites at the X30 seniors. Ending up on 6th place, the Cologne resident had a good starting position after qualifying and was able to tie in with this performance by achieving 6th place during the first heat. He then had some bad luck during the second. During the turbulent starting phase, he fell back considerably and only came in 22nd. This put him on 19th place on the overall list of rankings. Things didn’t get better during the first final race then. Once again, he was pushed off the track during the last lap and only came in 29th. Everything went smoothly during the last race of the weekend though. From the back of the field, Müller fought his way forward and was even able to collect some Championship points by coming in 12th. As second driver, Luca Walter got back into kart racing. The 2011 X30 junior Champion now started at the seniors and had to find his way back first. In the end, he came in 27th and 28th. Mach1 Motorsport’s next chance is going to present itself on June 21st/22nd. The second event of the ADAC Kart Masters is going to take place in Bavarian Ampfing then. German chassis manufacturer Mach1 Kart is offering multiple test days in Germany and Belgium around the start of the season. Interested drivers and teams are going to be able to assure themselves of the Mach1-chassis’ performance and the professionalism of a factory team. The successes speak for themselves: In the 2013 season, Mach1 Motorsport caused quite a stir throughout all areas – from club sports to Rotax Max and the X30 classes up to the DKM. 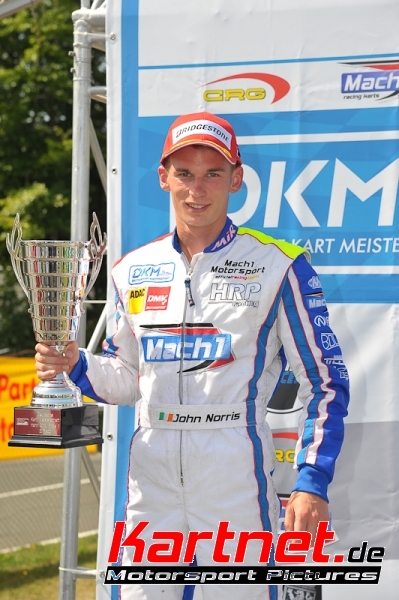 In the end, the manufacturer even achieved the third ADAC Kart Masters Championship title in a row. As a season preparation, the factory team of the German chassis manufacturer Mach1 Kart is offering ample test- and adjustment-drives for customers and others who are also interested. On appointment, the team is going to help with words and deeds and can also, if requested, provide material for the classes KFJ, KF, KZ, Rotax and Rotax DD2, Iame X30 as well as Micro/Mini. Interested drivers and teams can register for the test days by phone (+49 7135 / 9849-0) or via e-mail (info [at] mach1kart [dot] de). These are going to take place between February and April in Genk, Liedolsheim, Wackersdorf and Hahn/Hunsrück. The Mach1 Motorsport factory team is going to start at all the big national and international races in 2014. 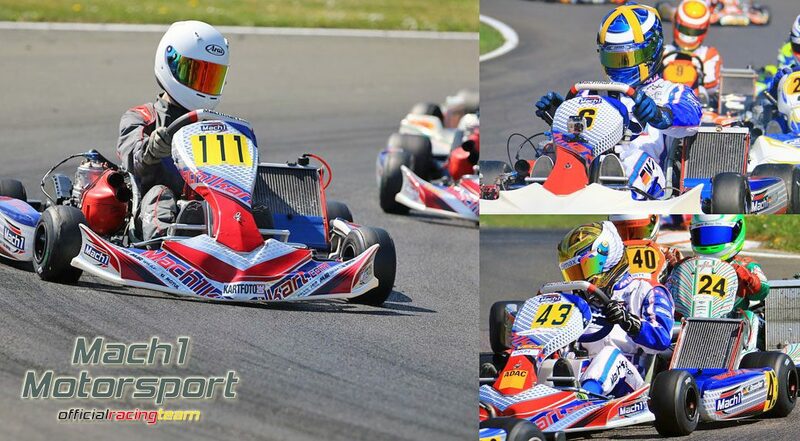 Among these are the CIK-FIA European Championship for the classes KF, KFJ and KZ, the German Kart Championship, the ADAC Kart Masters and X30 Euro Finale in Mariembourg. Additionally, more races can be attended on request. In addition to the factory team, Mach1 Kart is going to enter multiple Mach1 Factory Supported Teams into the races. Scheduled are the Rotax Max Euro Challenge, the Rotax Max Challenges, the ADAC regional series, the German Vega Trophy and many more. Inquiries from drivers and teams for Germany and abroad are still also welcome. A DKM season hasn’t been this exciting in a long time. After the fourth event of the German top series, German chassis manufacturer Mach1 Motorsport still belongs to the title favorites and can hardly wait for the big finale. After winning the vice title last year, they’re now aiming for the title. The 1.377m long track in the Hunsrück presented a big challenge for the drivers again. Fast bend speeds and wavy asphalt demanded the drivers’ full concentration. This posed no problem to the Mach1 Motorsport team’s protégés though: The quartet started into the semi final of the 2013 season highly motivated. 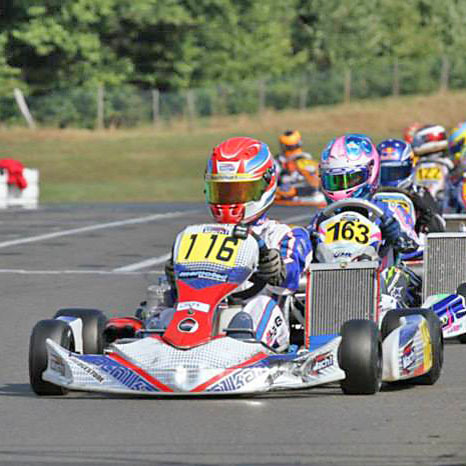 Julian Müller and Marco Forrer experienced a mixed weekend at the DKM. Guest driver Julian Müller fought with his influenza and engine problems throughout the entire weekend, which is why he wasn’t able to tie in with his usual performance. By coming in 13th during the first final, he still managed to gain the best from the situation. Swiss Marco Forrer drove in Hahn for the first time and had to get used to the challenging track first. During the course of the training and heats, he became faster and faster though and even managed to collect championship points by coming in 15th during the first final. Unfortunately he had to forfeit the second race prematurely due to a technical defect. “Both of them have done great jobs despite their problems. Unfortunately this wasn’t rewarded by good results in the end”, Martin Hetschel praised his protégés. John Norris started as the team’s spearhead once again. The Irishman belonged to the title favorites prior to this weekend already and did justice to these expectations by coming in third during qualifying. He tried preserving his tires a little during the heats and secured a good starting position for the finals by coming in twice during both heats. The first race took place on the wet track and John gave it his all. Due to a perfect setup of his Mach1-kart, he fought his way to the top and finished the race as the winner. He thereby took a big step towards the championship title and had a lot in store for the second final. But immediately after the start, the dream of a double victory was shattered. John was pushed into the off by an opponent and had to forfeit the race after only half a lap due to another collision. “This falling out has surely shifted the decision about the championship title to our disadvantage. We can still positively look forward to the finale in Genk though; our chassis works perfectly under all conditions”, Martin Hetschel explained in the evening. The DKM will now take an eight week-break after this exciting racing Sunday, before the final decisions will be made in Belgian Genk. John will travel there being on the overall third place and was able to achieve a double victory last year. Will there be a repetition this year? Before that, a couple of other races still await the team though, among them the next-to-last event of the ADAC Kart Masters in Kerpen next weekend.